Pipeline bending is mainly used in transport lines for oil & gas. Two types of bends are needed; field bends, which are made in the field and typically have radii larger than 40D, and tighter radius bends which need to be fabricated in advance. The most common way to produce these smaller radius pipeline bends is to make them on an induction pipeline bending machine from the mother pipe that is also used for the straight sections of the pipeline. Typical radii are 3D, 5D, 7D and 10D, although smaller radii are also possible in pipeline bending. Pipelines are usually made out of X-grade materials, sometimes cladded on the inside with stainless steel or Inconel and Duplex. The large transmission lines normally have relatively thin walls when compared to the diameter. 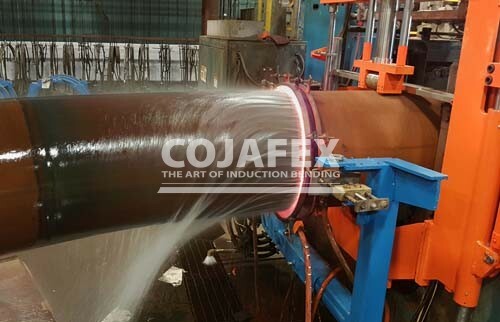 Cojafex pipeline bending machines are particularly suited to the task, because they combine excellent temperature- and dimensional control to produce high quality bends that meet the mechanical, metallurgical and dimensional requirements with a minimal effort. Bending angles and radii can be freely chosen, offering great flexibility to the designers of pipe lines. 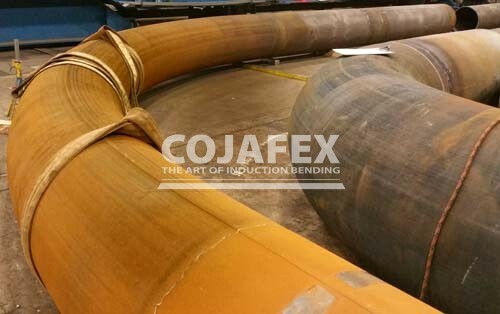 Cojafex pipeline benders are also suitable to make so called “segmentable” bends. These bends can be cut to the desired angle at a later stage, for instance in the field. More advantages of induction bending and types of bending can be found on the bends webpage. 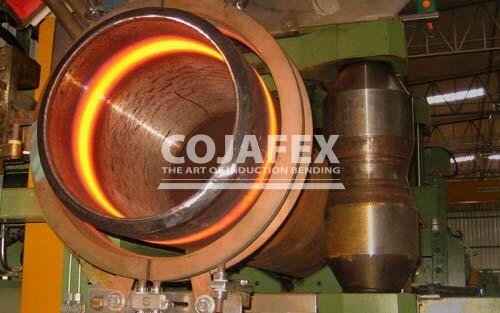 Cojafex offers machines for all kinds of pipelines. Larger machines such as the PB850, PB1200, PB1400 and PB1600 are used for transmission lines and smaller machines such as the PB200R, PB400R, PB600 can be used for other lines. 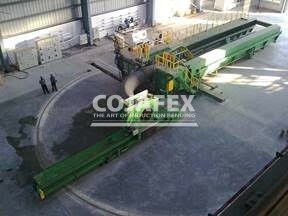 Cojafex machines are highly automated. 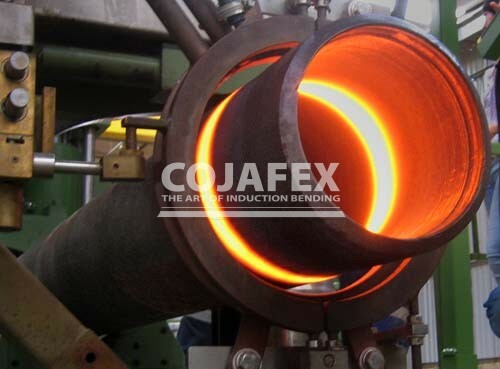 Cojafex pipeline bending machines have special start/stop systems which ensure smooth beginnings and ends of the bends. The induction power is automatically regulated based on accurate temperature readings. Temperature scanning mechanisms ensure that the highest temperature is measured in the heated zone. Especially with CLAD pipes (for instance with INCONEL-CLAD), Duplex and the high X-grades, it is very important to maintain the pipe line bending temperatures within a small range in order to avoid damage to the material. With the Cojafex controls, high quality bends can be made in a consistent manner with minimal effort. The pipeline bending machines can be equipped with a fully automated tangent heating system. This allows you to heat the straight tangent in the same way as the bend. This way the material properties of the bend and the straight tangents will be comparable. This is especially important when the pipes/bends need to be heat treated after bending, as is often the case for transmission pipe lines made of higher X-grades materials such as API – 5L X70, API – 5L -X80 and API – 5L X100. In order to limit the ovality of the bend pipes are often braced from the inside with steel or wooden supports. Putting in and removing these braces is labour intensive work. Cojafex' automated ovality reduction systems introduce forces in the vertical direction to reduce the ovality of the bend within the limit of the relevant specifications without braces. Companies such as McDermott in the US, Engie (formerly known as Fabricom), Salzgitter, Simas in Europe and CTRP and Trubodetal (part of OMK) in Russia use Cojafex machines to produce pipeline bends. They have produced bends for transmission pipelines such as Nordstream, South Stream, Power of Siberia, Baydaratskaya Bay, Dzhugba-Sochi, Keystone, East Siberia-Pacific Ocean, Druzhba pipeline, Yamal-Europe Pipeline and Zeelink. Please do not hesitate to contact us and share your requirements and demands. Our extensive experience and our engineering capabilities are at your service for tailoring the equipment to suit your needs or design special solutions to meet your challenges.